Directions& Map T Carolyn, Formal Wear, Best Prom Dresses, Evening Dresses, Plus Sizes, Gowns Mother at the wedding. For GPS users 10805 Louetta Rd. Houston, TX 77070 will bring you right to the Vintage main entrance. What to expect when you visit T. Carolyn. To make it easier on our guests, we do not take appointments. This way, if a plane is late or you are caught in traffic it will not make scheduling problems. When you arrive, you will be greeted and encouraged to look through the racks to find up to 4 garments you would like to try on. This will allow you time to look through our selection without feeling pressured. When you have selected up to 4 garments, or feel you are ready to work with a consultant, you will find consultants (dressed in black) near the back dressing rooms. Consultants may work with up to 2 customers at the same time. She will ask you important information about your upcoming event in order to properly advise and assist you. Your chosen garments should be given to a consultant who will assign you a room if one is immediately available, or place you in line for a room. 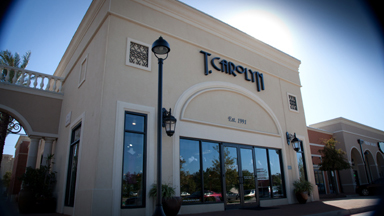 After trying on the dresses you have selected, your consultant will offer advice as to what may be a better choice. To get the most out of your “T. Carolyn experience”, allow your consultant to give her professional advice and be prepared to consider a look that may be new for you. Your consultant will be able to recommend accessories to compliment your choice. Our buyers have spent a great deal of time searching for the perfect jewelry and accessories to go with each dress. Proceed south on John F. Kennedy Blvd.to Beltway 8. Turn right onto Beltway 8 and continue west on Beltway 8 which becomes the Sam Houston Toll Road. Continue west on the Sam Houston Toll Road to TX 249. Proceed north on TX 249 to the Louetta Exit. Turn right onto Louetta eastbound. Go east on Louetta about Go east on Louetta about ¼ of a mile. At the Starbucks building, turn right onto the main entrance to the Vintage Park Center. Proceed straight ahead to T. Carolyn immediately to the right of the double arch. Take TX 59 South to the Sam Houston Toll Road west to TX 249 north. Proceed north on TX 249 to the Louetta Exit. Turn right onto Louetta eastbound. Go east on Louetta about 1000 ft. At the Starbucks building, turn right onto the main entrance to the Vintage Park Center. Proceed straight ahead to T. Carolyn immediately to the right of the double arch. Take I-10 West to Beltway 8 North continue on Beltway 8 to TX 249 north. Proceed north on TX 249 to the Louetta Exit. Turn right onto Louetta eastbound. Go east on Louetta about ¼ of a mile. At the Starbucks building, turn right onto the main entrance to the Vintage Park Center. Proceed straight ahead to T. Carolyn immediately to the right of the double arch. Take I-45 North to the Sam Houston Toll Road west to TX 249 Proceed north on TX 249 to the Louetta Exit. Turn right onto Louetta eastbound. Go east on Louetta about ¼ of a mile. At the Starbucks building, turn right onto the main entrance to the Vintage Park Center. Proceed straight ahead to T. Carolyn immediately to the right of the double arch. From Lake Jackson and Angleton take Texas 288 to the 610 Loop westbound. (Those from the Astrodome should take the 610 Loop westbound. Continue around to the West Loop northbound. Those from the medical center and Galleria should take the West Loop northbound.) Continue north on the West Loop and take Highway 290 West to the Sam Houston Toll Road North. Continue north on the Sam Houston to TX 249 North to the Louetta exit. Turn right onto Louetta eastbound. Go east on Louetta about ¼ of a mile. At the Starbucks building, turn right onto the main entrance to the Vintage Park Center. Proceed straight ahead to T. Carolyn immediately to the right of the double arch. Take Highway 59 North to the Sam Houston Toll Road North. After crossing over I-10 and Highway 290 continue on to northbound exit to TX 249. Go north on TX 249 take the Louetta Exit and turn right on to Louetta eastbound. Go east on Louetta about ¼ of a mile. At the Starbucks building, turn right onto the main entrance to the Vintage Park Center. Proceed straight ahead to T. Carolyn immediately to the right of the double arch. Take 1-10 to the Sam Houston Toll Road north. After crossing over Highway 290 continue on to northbound exit to TX 249. Go north on TX 249 take the Louetta Exit and turn right on to Louetta eastbound. Go east on Louetta about ¼ of a mile. At the Starbucks building, turn right onto the main entrance to the Vintage Park Center. Proceed straight ahead to T. Carolyn immediately to the right of the double arch. Take Highway 290 East to FM 1960 East. Continue east on FM 1960 to TX 249. Turn left onto TX 249. Go north on TX 249 take the Louetta Exit and turn right on to Louetta eastbound. Go east on Louetta about ¼ of a mile. At the Starbucks building, turn right onto the main entrance to the Vintage Park Center. Proceed straight ahead to T. Carolyn immediately to the right of the double arch. Proceed east on Airport Blvdto I-45. Turn left onto I-45 North. Take I-45 North to the Sam Houston Toll Road westto TX 249. Proceed north on TX 249 to the Louetta Exit. Turn right onto Louetta eastbound. Go east on Louetta about ¼ of a mile. At the Starbucks building, turn right onto the main entrance to the Vintage Park Center. Proceed straight ahead to T. Carolyn immediately to the right of the double arch. Continue south on the access road though the Jones Road intersection to the next traffic light which is Louetta Rd. Take TX 99 (Grand Parkway) Toll Road westbound and proceed as above. Take I-45 south to the Louetta Exit. Turn right onto Louetta westbound. Continue westbound on Louetta. 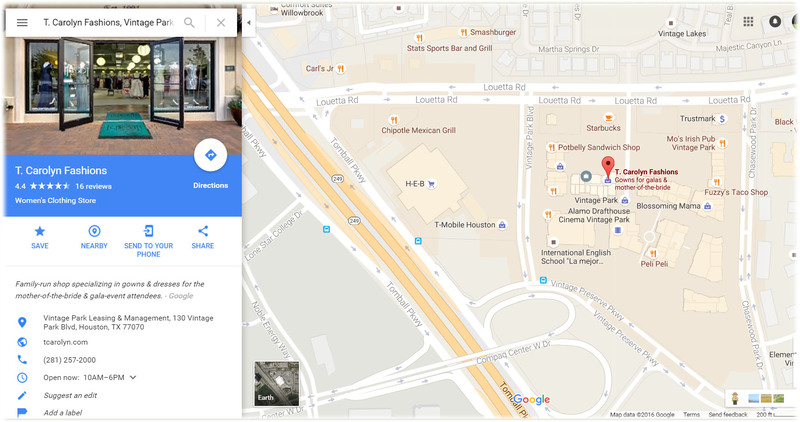 Shortly before reaching TX 249, turn left at the Starbucks building, onto the main entrance to the Vintage Park Center. Proceed straight ahead to T.Carolyn immediately to the right of the double arch. Take I-45 South to Sam Houston Toll Road west to TX 249 north. Proceed north on TX 249 to the Louetta Exit. Turn right onto Louetta eastbound. Go east on Louetta about Go east on Louetta about ¼ of a mile. At the Starbucks building, turn right onto the main entrance to the Vintage Park Center. Proceed straight ahead to T.Carolyn immediately to the right of the double arch.